Description - Developed to be used in a variety of climates, our Revival strand woven bamboo flooring is the perfect flooring option for any home. Featuring a distressed look in several high end colors, these flooring planks are certain to add sophistication and style. Strand woven bamboo is twice as strong as oak and with our Endura AR UV-Cured Aluminum Oxide finish, these planks are able to withstand even the harshest of commercial environments. Perfect for any DIY project, our Revival bamboo flooring is backed by a lifetime warranty and is certain to look beautiful for years to come. 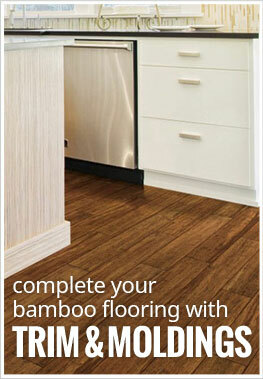 Material – Our bamboo flooring is constructed with premium 6 year Moso bamboo. Size – Our bamboo floor planks are 4.75" wide x 36" long. Weight – Each plank weighs ~2.93 Lbs. Recommended Uses – Revival strand woven bamboo flooring is both beautiful and strong and can be found as flooring in both residential and commercial spaces. These flooring planks have been installed as flooring for offices, as bedroom flooring, in basements, as den flooring, as living room flooring, in home offices, as flooring for churches, in libraries, as flooring for kitchens, as dining room flooring, as flooring in half baths and much more. Make sure to periodically clean exterior and interior floor mats to ensure that tracking of mud, dirt and debris does not persist. Do not use abrasive cleaners that leave dull residues. Never wet mop the floor with water and do not allow excess cleaner to remain on the floor surface as this may permanently damage the wood. Steam cleaners are not recommended. Prior to installation, inspect the bamboo planks in daylight for visible faults/damage. Check if subfloor/site conditions comply with the specifications described in these instructions. If you are not satisfied do not install, and contact your supplier. Lay the PE film or 6 mil poly vapor barrier sheeting, allowing for at least 20 cm (8”) overlapping and tape. Turn the film upward 5 cm (2”) along the walls. Trim after the skirting boards are fixed. Begin installation next to an outside wall. Establish a straight working line by measuring an equal distance from the wall at both ends and snapping a chalk line. The distance you measure from the wall should be the width of the plank plus about 3/8” for expansion space. Work from several boxes of flooring and “dry lay” the floor before permanently laying the floor. Before gluing a floor you will want to test for moisture. If moisture is not in line with the manufacturers specifications, a sealer will need to be applied. Provide 3/8” expansion gaps to walls and around other fixed objects. Start in the left corner with the tongue facing the wall. Align the next piece by overlapping the end of the first board so that the joint is tight when the board lays flat. Continue in this manner until reaching the final plank in the first row. Cut the final board piece to length allowing for required expansion gap. Place spacers against wall to restrain movement and maintain expansion gap. Begin the second row with the cut piece from the first row. Note: If the piece is shorter than 8”, do not use it. Instead, begin with a new board that is at least 8” in length and allows 8” between the end joints on the adjacent planks. Position the first board in place by angling it up slightly, pushing forward and interlocking the side tongue. Slide the board to the left as necessary to align the edges of the end joint. Carefully push the board down until the tongue and groove lock together on the side and ends. A slight tap with a tapping block is necessary to complete the interlock. Restrain the movement of the board by inserting a spacer in the expansion gap at the end of the board. Install the remaining boards and rows in the same manner. Cut the last board to size allowing for the required expansion gap. Place spacers against the wall to restrain movement and maintain the expansion gap. Whenever practical, use cut pieces from previous rows as the starter board to reduce waste. Maintain 8” spacing between end joints after the first four rows for best appearance. The last row may need to be cut lengthwise. Place the last row of planks to be fit on top of the last row of install planks. Use a piece of plank as a scribe to trace the contour of the wall. Mark where the board will be cut. After the boards are cut, position planks and tighten the fit using the pull bar. For printable installation and care instructions, please Click Here. Can be installed at, below or above grade. Great for both dry and wet environments.